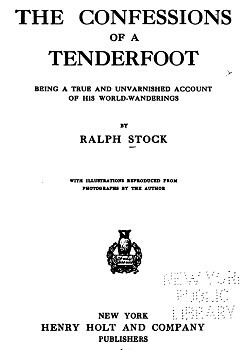 Ralph Stock : Surf-Board Riding at Waikiki, 1913.
being a true and unvarnished account of his world-wanderings, by Ralph Stock. With illustrations reproduced from photographs by the author. 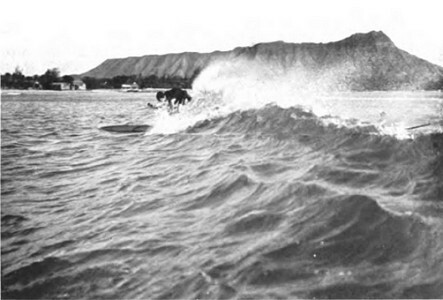 A brief account of Stock's first attempt at surfboard riding at Waikiki and, unusually, a water-shot by the author. Reprinted in part from the Captain and the Wide world. dential houses with their lanais, or verandas, supported on wooden posts, jutting out over the blue Pacific and making it possible to take one's morning dip from one's bedroom window. The temperature of the water never goes below 65 degrees, and one may wear a bathing-suit all day long, and, with a dressing-gown over it, have meals at one of the restaurants that adjoin the palm-fringed beach. The booming of the surf out at the reef ceaselessly calls swimmers to take out their surf-boards and - lying on them, if novices, and standing if practised - speed shorewards on the summit of a Pacific roller. This is the chief sport of both whites and natives at Honolulu, and requires a good deal more knack than might be supposed. My first attempt was a hopeless failure. In some way I must have shifted my weight on the frail surf-board, for in a trice the great roller on which I rode caught me like a feather, and hurled me downwards through a trough of seething foam to hit my head on the coral bed below. I rose to the surface half stunned, and someone seized my arm or I should certainly have drowned. Then how fascinating were the reefs! Geoff Cater (2017) : Ralph Stock : Surfboard Riding, Waikiki, 1913.